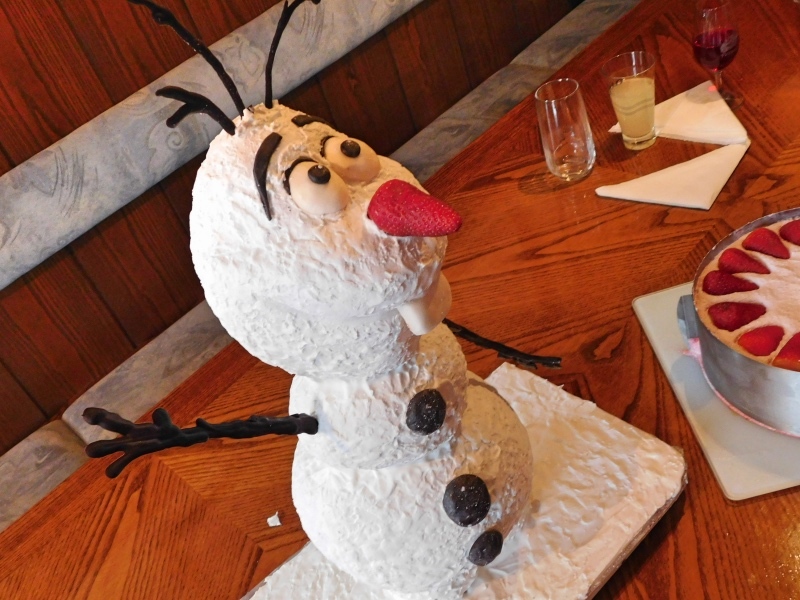 Chef Yener shows you how to put together this 3D Olaf Cake with a number of different techniques. You will also learn how to create an internal structure that can be used for any other 3D standing figure. The blueprints/templates are available to download for free under the ‘Materials’ tab but you will need to create a free account and be logged in to be able to download them. 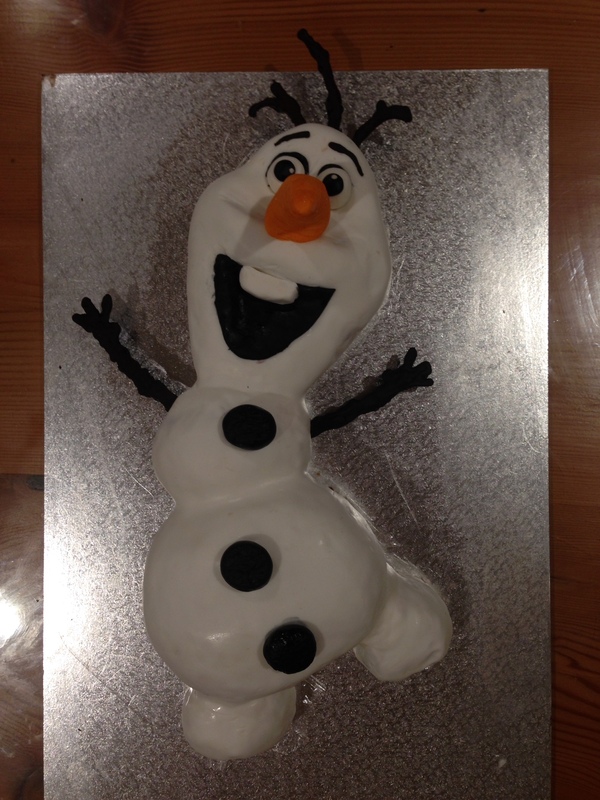 This PDF contains blueprints & templates to help you make this cake. 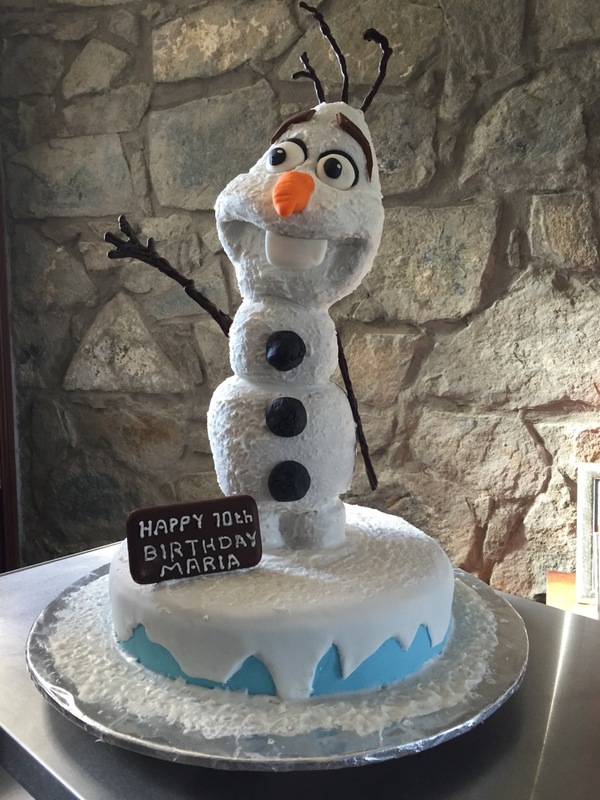 how much white fondant was used? I’d like to use white marzipan. Two questions: you say to use a sponge cake, but your cake is black. Have you added cocoa? If so, how much, and how much flour was replaced by cocoa? At the same time, you do not use eggs for the sponge cake? Absolutely beautiful. 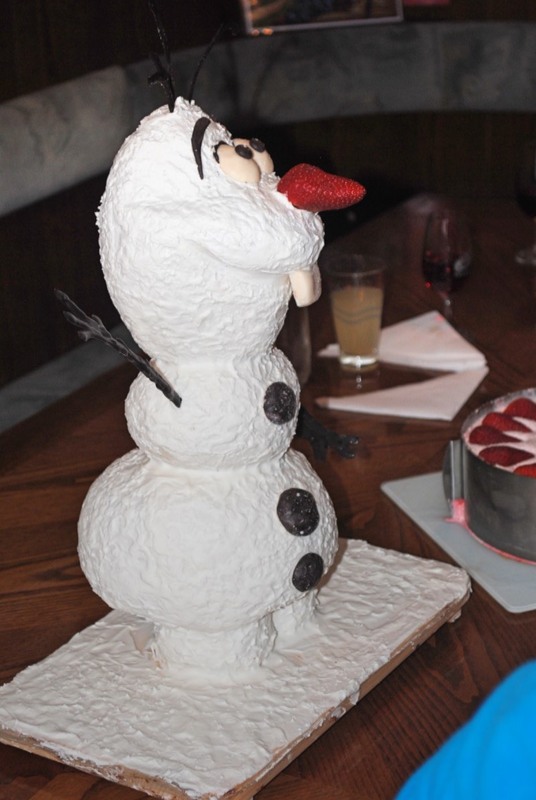 Such attention to detail … a really beautiful cake. Thank you for your video so inspiring. 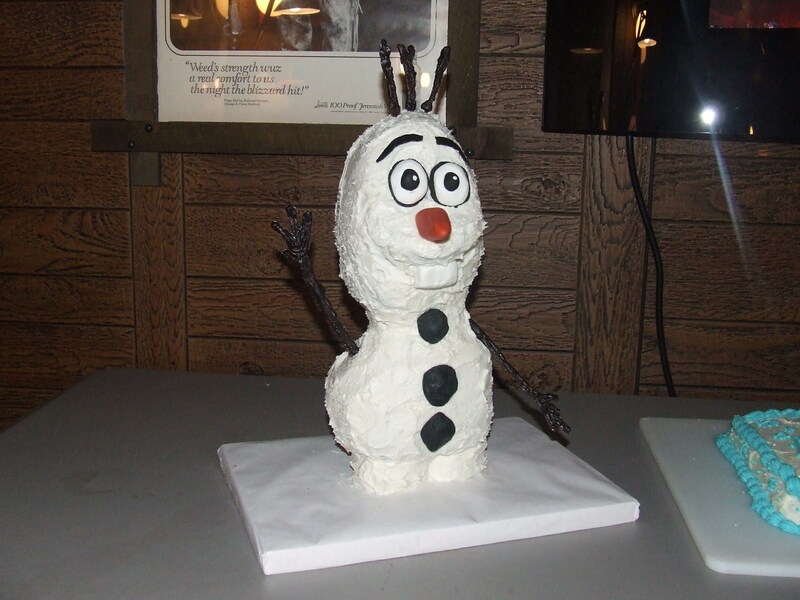 for the body of Olaf? 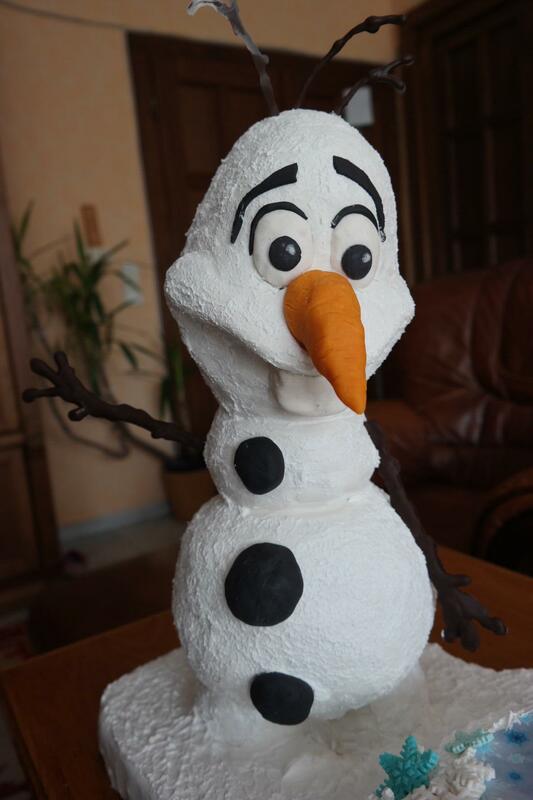 I’m french and I Want to make 3d Olaf’s cake for the first birthday of my son to november, 5th. 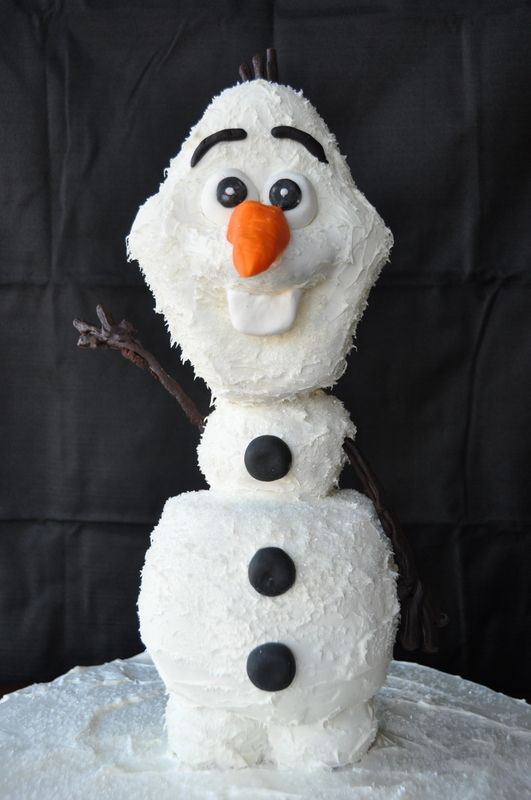 But I don’t understand the recipe cake and what to make the paste cake for modeling olaf’s face. Can you give me the recipe of cake paste? 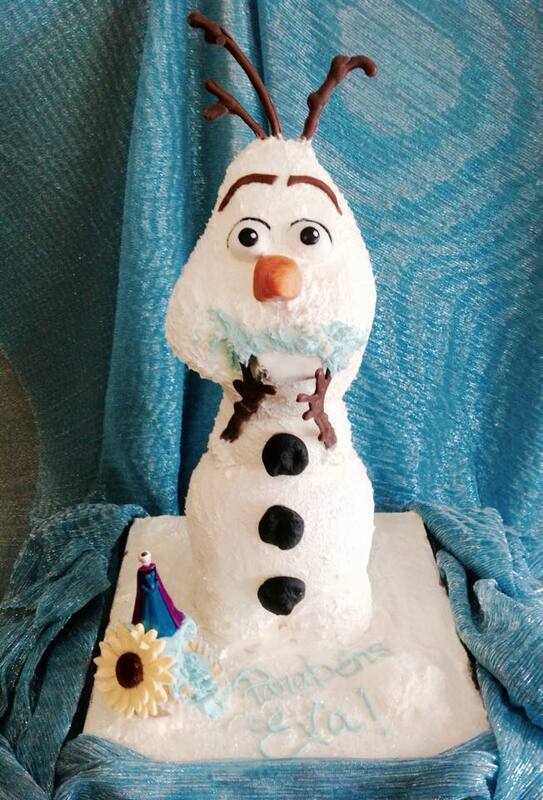 Hello, I am making this cake for my daughter next weekend. I was wondering when would be the best time to start baking the cakes. Do I need to make them a day or two before the party of the morning of the party? And also does it need to stay in the fridge or freezer till it’s time to start serving it? Thank you so much. 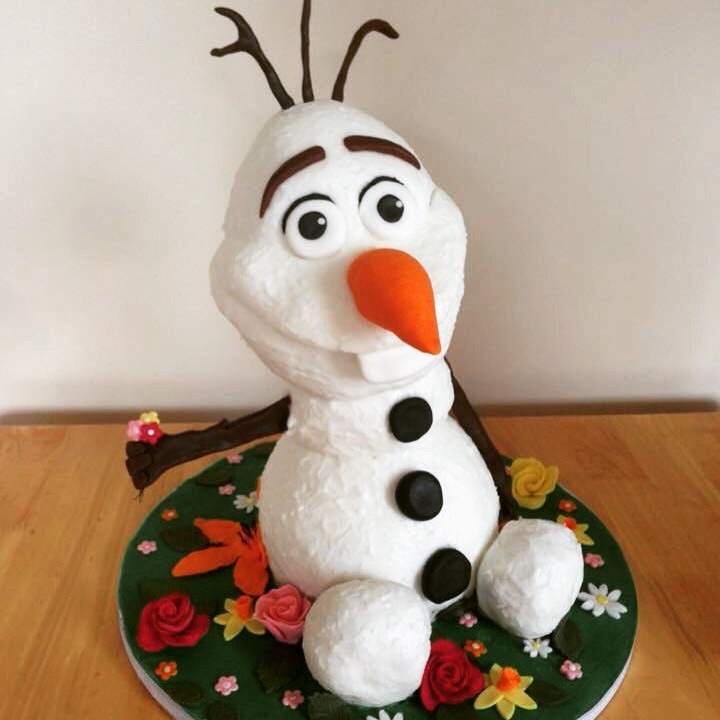 I had never made a 3D cake and I would like to know if I can use white modelling chocolate instead of fondant? I am going to try this for my granddaughter’s birthday! I think I have everything figured out, and I have a handy husband for making the board and providing the rod. My only question is, can I add caramel to the chocolate ganache? My granddaughter has asked for a caramel cake, so I’m going to use your white mud recipe and I’d like a caramel ganache. Would caramel candies melted into the ganache work, or a jar of caramel sauce? Thank you! 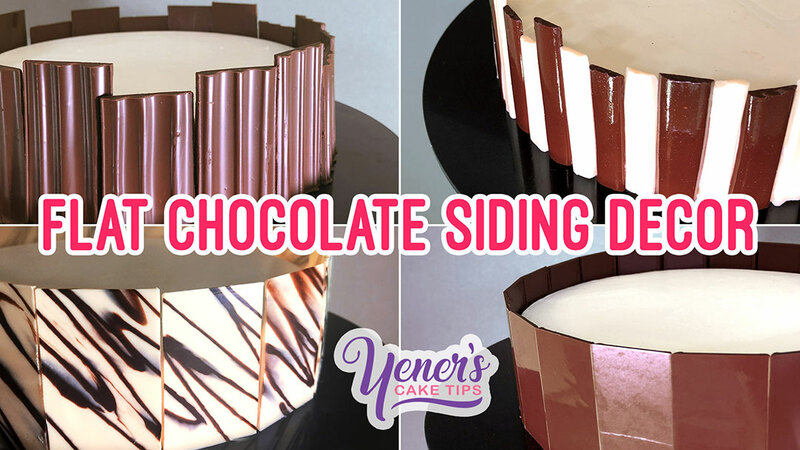 One more question – how much ganache is needed for forming the layered molded cakes and icing the cake? Double the ganache recipe? More? Thank you! No that will make the cake very sweet. 1. caramelise the sugar in the white mud cake in big pan and add the butter than continue the normal method for baking . For the ganache you do your own caramel just a bit of sugar well caramelise and add cream to make it soft . use this to add in to ganache cream. I am using compound chocolate and 40-45 c degree is right temp for keeping melted. But havent you temperated the chokolate ?. compound chocolate does not need to tempered. Every time you do something shortly place in the fridge. 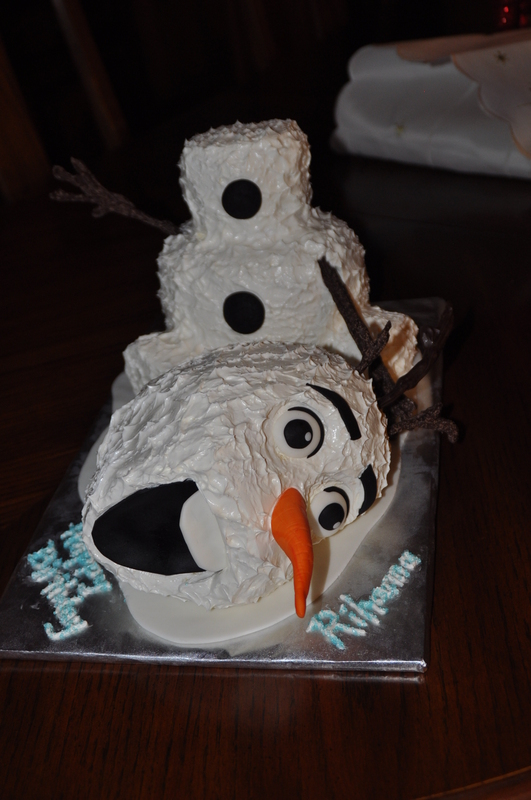 Roughly how much fondant was used? Would any cake recipe work when making this 3d cake?Thanks in advance for your time. Thank you Chef Yener. I’m going to give it a try. Thanks. Hello A Page! I personally used chef Yeners chocolate mud cake recipe. double the amount. it tastes and works perfectly!!! Hi Olivia! Thanks for the response. I’m going to give it a try ☺. 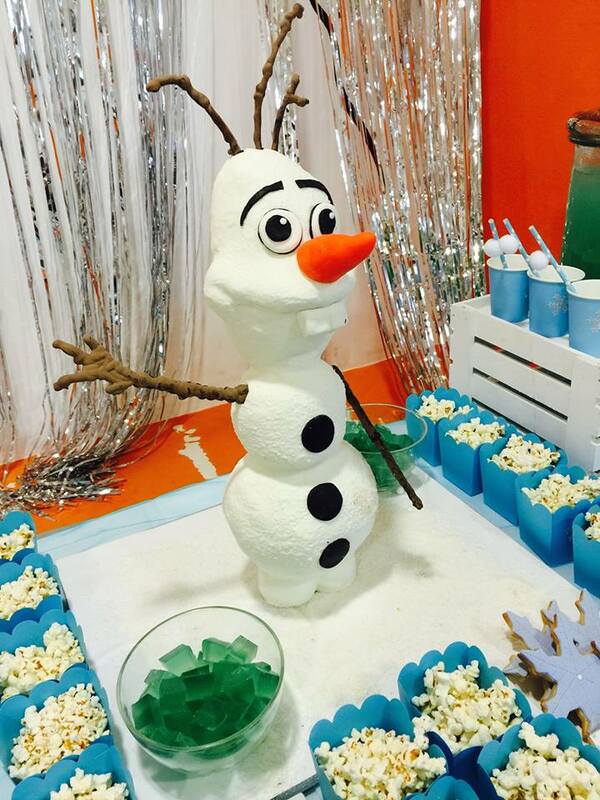 BTW..your Olaf looked great! hi where do I find the black silicone flexible cake scraper you use? Hi Stacey The flexible black scraper I use is not silicon just plastic. You can just cut from a lid of a food container or ice cream tub. make sure it is not brittle . I’ve watched the video a few times now and have a few questions. This is a great video , thank you. I would like to start making this next week. 1. Length & diameter of rod? 2. What is the diameter of the large silver cardboard washer? 3. Is the cake board 16in diameter? 4. Are all cakes in this project 1 in rounds? 5. The tummy is 4 (6in) cakes , correct? 6. The neck is 9cm cakes (3.6inches), so I bake 4 inch rounds right? 7. What size & shape cakes do I bake for the head? How many? 8. Length & diameter size of gray fondant roller? 9. Names of 3 white tools used throughout video? 10. Is “rolling” fondant different than other fondant you were using ? 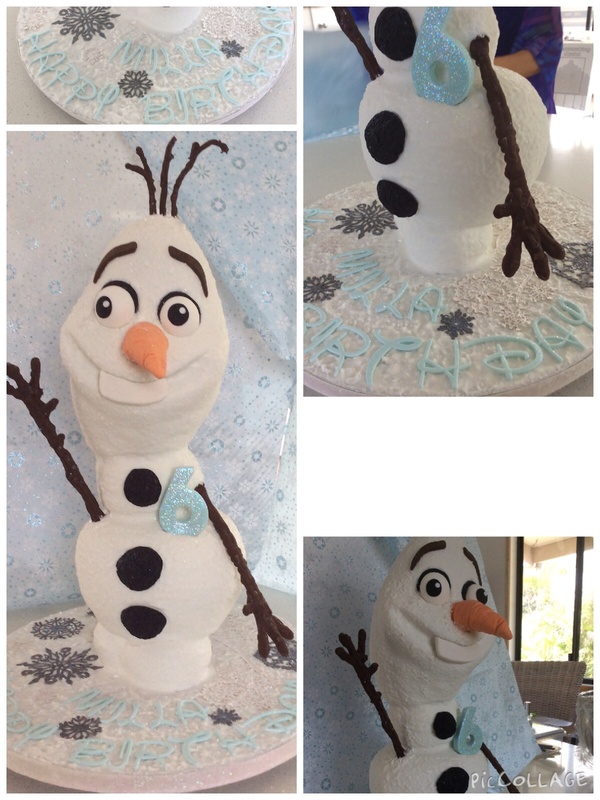 If so, what types of fondant do I need? How much fondant needed for either each part or in total? 11. 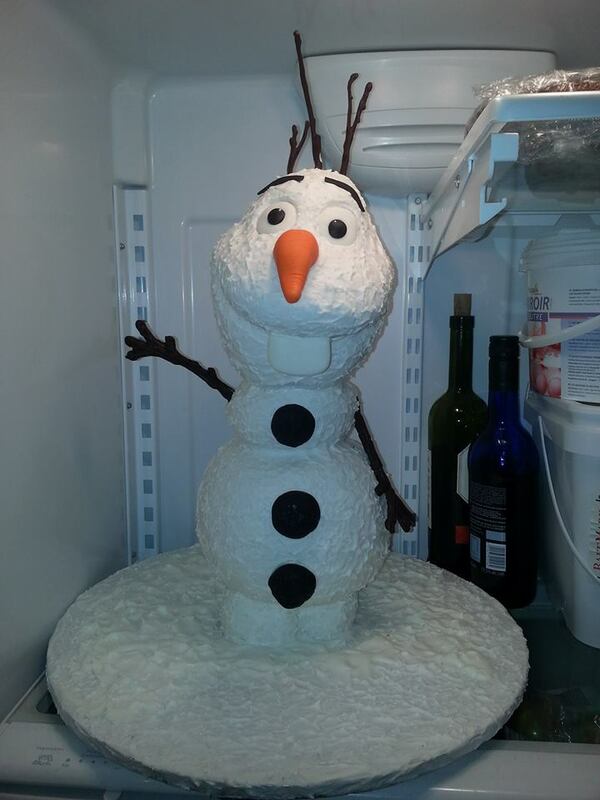 Can I gel color white fondant? If so, when do I put it in…before or after initial kneading? 12. Did you use your mud cake recipe for this? 13. Is there a tutorial on how to read your recipes? ( probably a silly question for you amazing bakers, I’m a beginner, it looks confusing and I don’t understand how to figure out how much for each cake needed). 14. Can I use regular store bought milk chocolate morsels for melting for the crusting step? 15. How do I get the heads to shape like yours are? When I read the first question I understand you did not printed all templates and plans from downloadable section under need the video.Please do that first and go through all your questions again. You will have my answers. I’m confused with answers 1,5,6,7,11,15. I printed out eat thing at 100%, the templates are about a 1/2 inch all around smaller than the blueprints, is that supposed to be like that BC of all the layering? Or will my measurements be totally off and have an effect on the proportions of the cake? Also the template for the arms are an inch larger than the blueprint too. The side view is off by some too. Please let me know if this is normal. 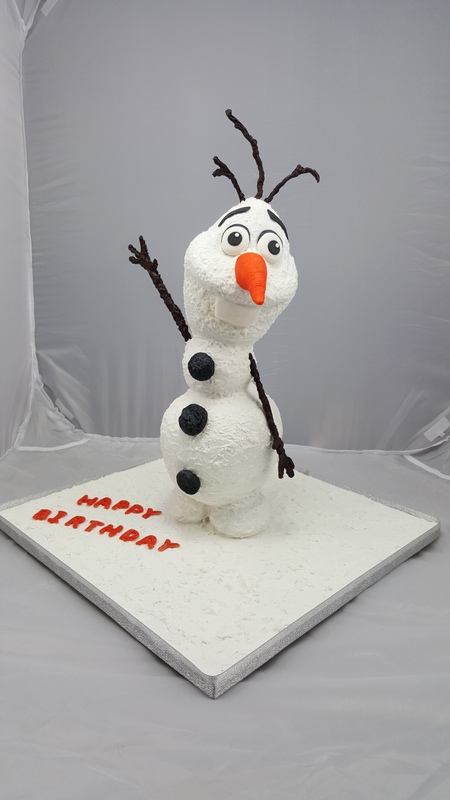 Yes kind of because, twice masking,chocolate crust coat , fondant and royal icing.. one of the arm need extra length to push in to body. I thing you should just go for it…. Thank you so very much for answering many of my questions. I will let you know how it turns out. I’m hoping to do a few practice one before final. I’m a brand new baker, I have no clue what I’m doing, but catch on quickly. 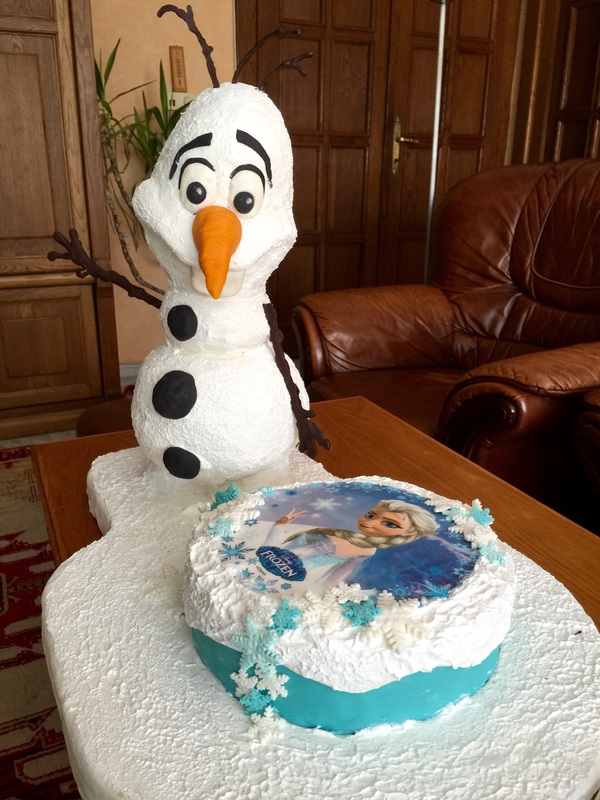 My son wants this cake and I need help. 1. what materials will I need to purchase and what sizes? 2. What type of cake did u bake. 3. What size pans and how many? 3. How did you get from the baked cakes to those molded pieces you show in the beginning? 4. Recipe for ganache you use? 5. In the warmer is it just regular chocolate chips melted or semi sweet? Anything else added? 6. Do I just buy fondant and color it with gel colors? If so, what brand is best? Do I need to do anything to it before coloring it or applying to cake? 7. 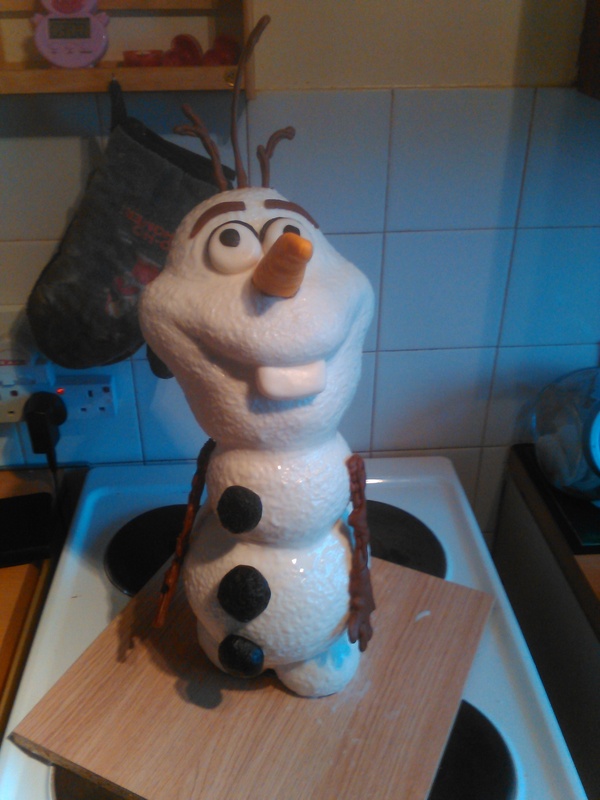 The arms and hair are just made out of the melted chocolate in the warmer right? Thank you serder for replying. I will get started on that. I’m so excited about this cake!! Hello, thank you so much for taking the time to create this video! I was wondering what you recommend as the best way to transport this cake? I plan on driving it about 30 minutes to a family member’s house and I was not sure if there was anything else I could do to secure it? Thank you!! How do you get the shape of the cakes? Translation: Superb! Thanks for the lesson. Hello, I was just curious how you shaped the cakes? I can’t figure it out. Thanks! I loved this tutorial. You are a great and excellent teacher very genuine. May god shower lots of blessings. I just made this for my daughters 9th Birthday. She Loved it! Thank you for posting. 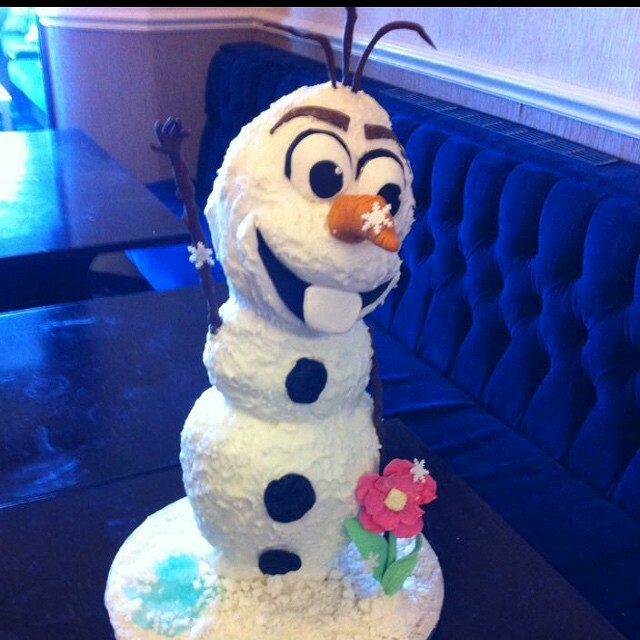 Hi, I would like to ask you for 25 people, what cakes should I bak to make Olaf? Thank you so much! The size of the cake in the video is just nice for 25. Dark mud, white mud or butter cake, with dark ganache, white ganache or butter cream will all be ok.
Can you please tell me what the best way to cut this cake to be served. Thanks in advance. Great tutorial. I am loving this site. 1. Prepare tall bucket and fill with hot water. 2. Place 2 or 1 slicing knives in the water. Water level should cover the metal parts of knives. 3. Place a clean kitchen towel near the bucket to dry knives before each use. 5. Slice and remove a piece from cake as large as possible to the chopping board. 6. Dab the hot wet knife on the towel but keep it a little wet. 7. Slice desired portions while alternating the knives each time. Hi Serkan, yes that was my question and thank you for your quick response. my cakes are carved an d wrapped in glad wrap in the fridge so I will check and decide on the crumb coat or straight to chocolate. Hi Dawn, yes it does. I am so daft sometimes. Serdar/Serkan do i ganache my cakes once i have carved them to shape and before I put the chocolate shell on them? 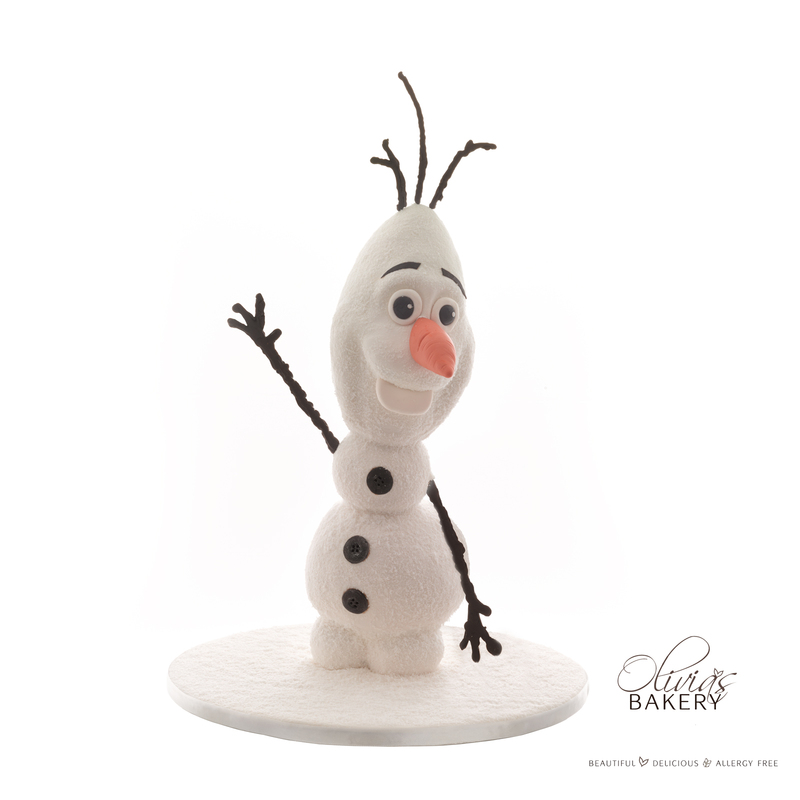 I am making my snowman now and I haven’t made them in molds. I suppose your question could also be, “Do I need to do a crumb coat?”. Well, crumb coating is basically to make the cake a little smoother and to stop crumbs from coming off the cake. Sometimes when I get to that stage just after carving, the cake is nice and smooth and the cake is at a good cold temperature, and there are basically no crumbs. In this case I like to go straight to chocolate because I feel like the chocolate gets a better grip on to the cake because it seeps in to all the little pores of the sponge. I find that some times when the cake warms up to room temperature, the ganache (crumb coat) can break away from the sponge (if it is still being worked with) which also causes the chocolate to break away and ultimately have a poorer hold on things. 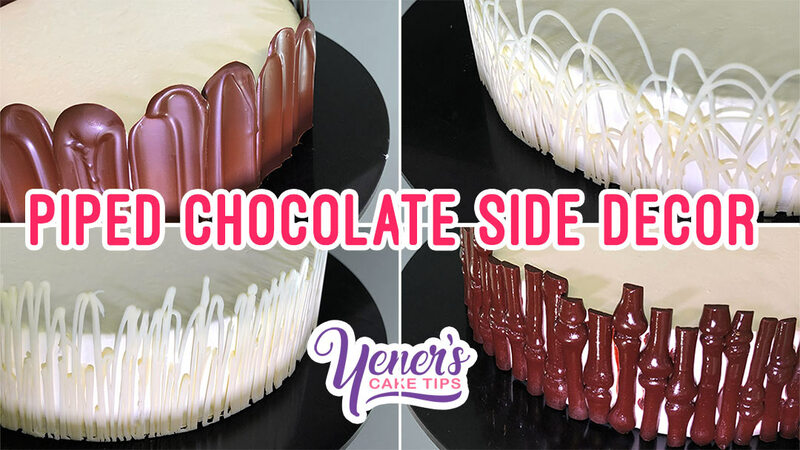 So basically, if your cake is smoothly carved, firm and it is not crumbly, than go to the chocolate step. 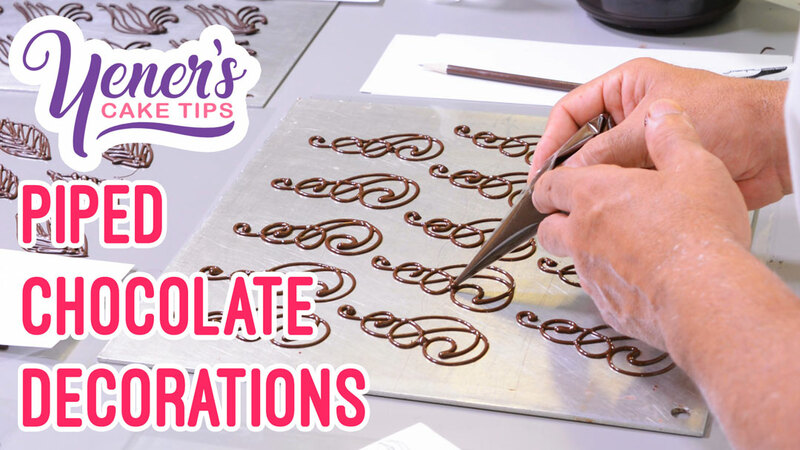 If you have bumps, an irregular surface and it is not smooth, than apply a thin coat of ganache before the chocolate to make it smooth first. Thank you Sarah! In the second line in the comment with the recipe, Serdar says it is all in grams. 🙂 Do you know why his cake looks the way it does? Is it because it was wrapped and refrigerated, do you know? I am so very impressed by your skill, ingenuity and charity. I have never made a 3D cake and am therefore a bit nervous, but I’m sure I can do it. Maybe it’s my computer screen, but I was wondering why your cakes seemed smooth, shiny and not layered from the start? I’m also curious about the molding you made. You said it’s cake and ganache mixed together? Dawn it will be just like a cake pop mixture. Thank you Serdar! I will try this recipe. Are the measurements all in grams? 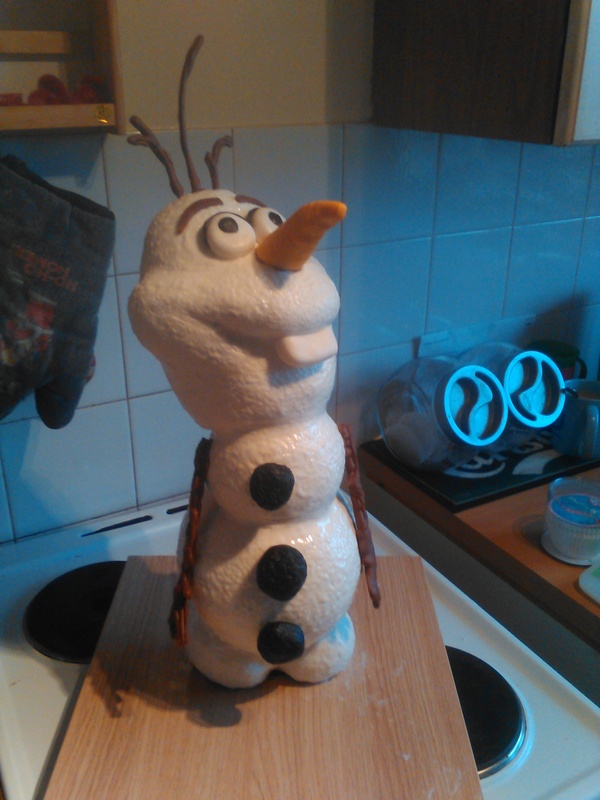 Here’s hoping he turns out looking like Olaf. Cheers! This is Serkan, (Serdar’s son). 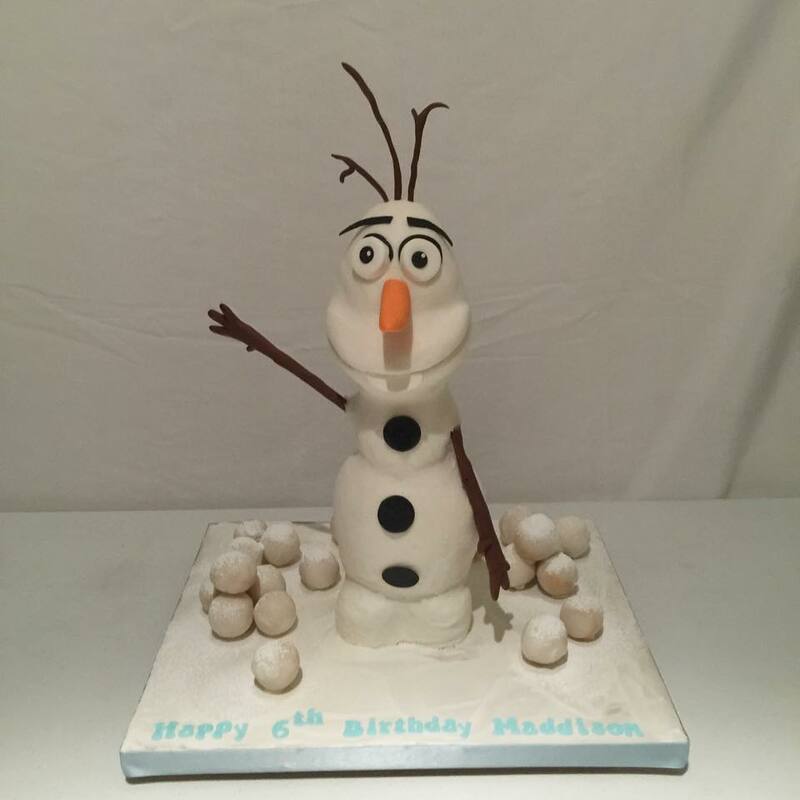 The cakes we use are pre-made meaning they are baked and layered within cylindrical moulds and stored in the fridge. I am not sure what you mean by smooth and shiny from the start but I think this is what you mean. The cakes are layered (sandwiched) within a perfect cylindrical plastic mould. So when the cake is cooled and set in the fridge, we remove the plastic mould and have a perfectly cylindrical cake to work with. We will show this in future tutorials. 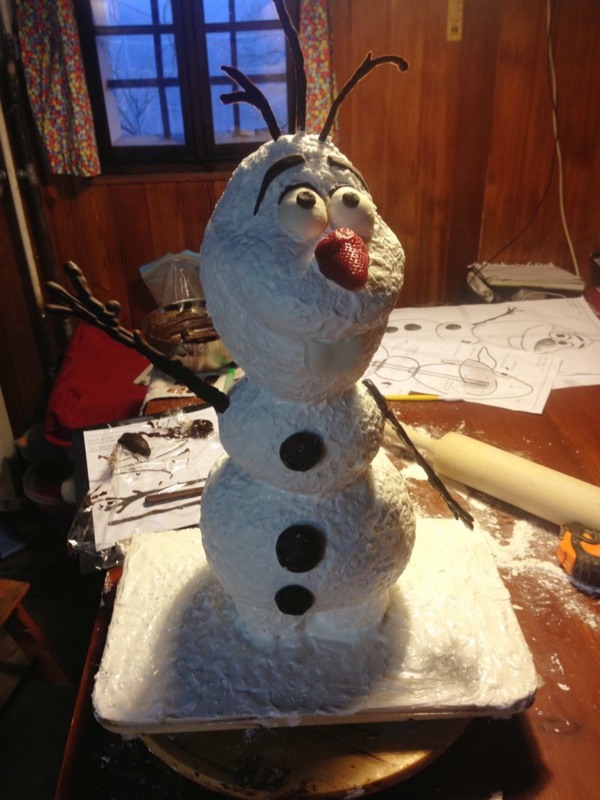 Yes the part that is used to model the mouth part of Olaf is just the same cake that is mixed (sponge and ganache) which results in a cakey paste that is very similar to play-doh. Good Morning, i’m curious about these cylindrical molds. Where can I purchase them? have you decided to sell them as well? and what size cakes and how many are you using for this cake in total? Love it! 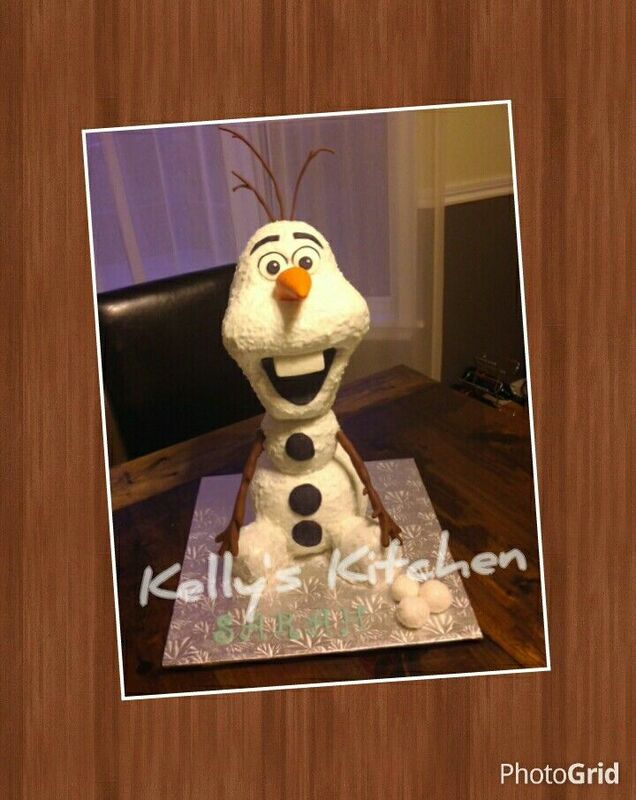 I am going to try to make this for my girls frozen themed party in two weeks time. I hope gluten free mud cake holds up. Thank you so much from Australia. Hi Sarah I am going to add gluten free chocolate cake recipe soon in our recipes section but i don’t think will be ready on time . We are in holiday at the moment I will sent you the recipe on thursday maybe you can try. That will hold if you sandwich it with our ganache..
Hi, for working in hot , humid weather, would ganache or buttercream work best? Would I need to alter the ingredient ratios on these due to heat conditions?Thanks! 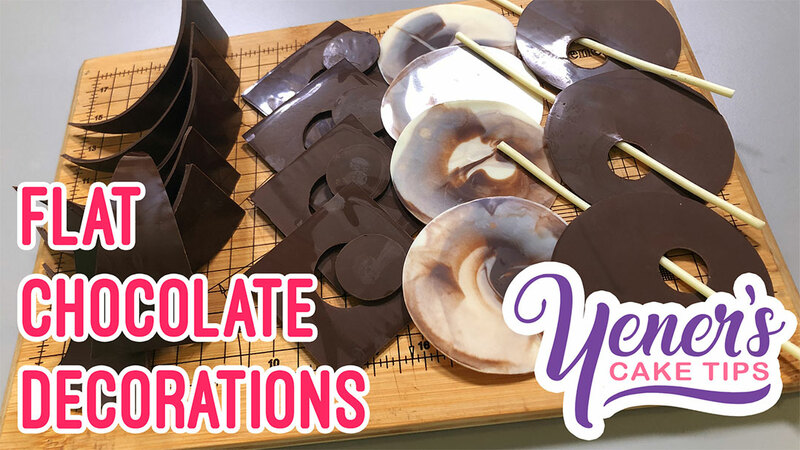 Hi, do you use ganache to fill and coat the cakes, before placing in fridge? What do you have in the melting pot, ganache or plain dark chocolate? Love your tutorials, you are an excellent teacher! 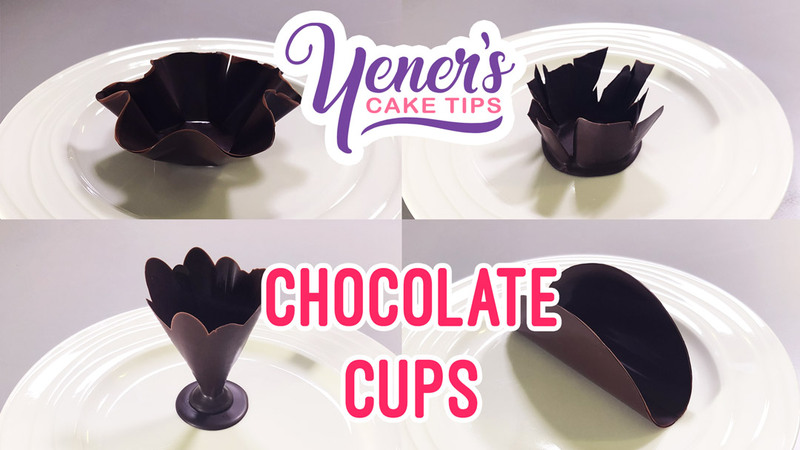 Thank you Chef Yener…..I must say that this video is very detailed but it is looks very easy to replicate. Your directions and clear and easy to follow. You are a very, very good teacher and I really appreciate that you took the time to make and film this cake for us and offer it for free. You truly are a great teacher. Can not wait, would love to see the princesses as well, hint hint!!….. Any ideas on when it’s going to be out? 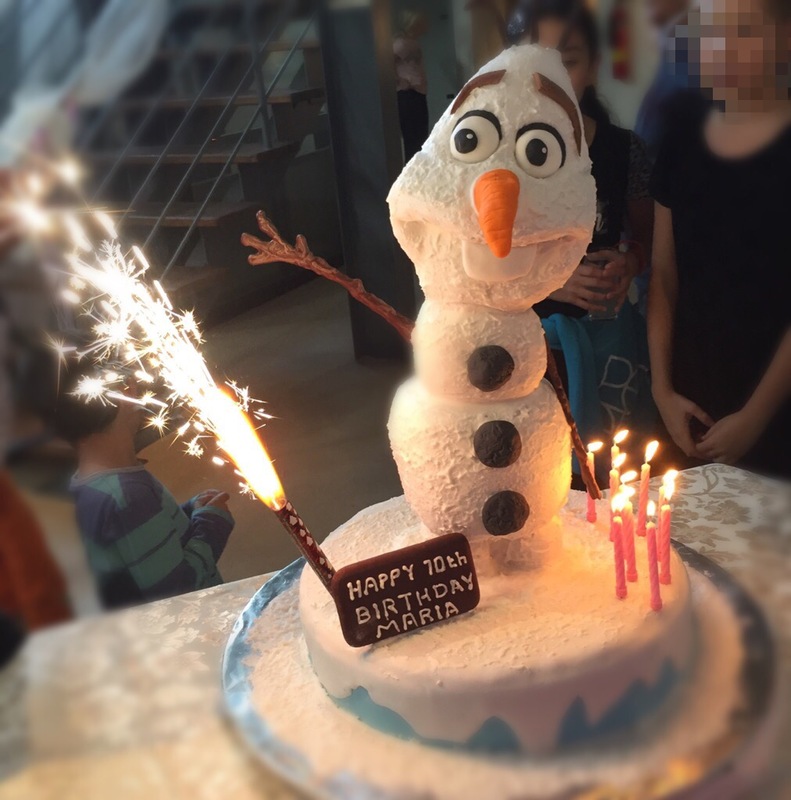 I’d like to make this one for an upcoming party, it’s fantastic! Thanks. All I can say is that it will be released some time in August. Meaning anywhere between a week from now to the end of August. Yes of course 🙂 Sorry for the long wait but we have to put premium tutorials as a priority. Thanks for your patience. Cannot wait! Love this site. I can’t wait for this one. What about the princesses Elsa and Anna?